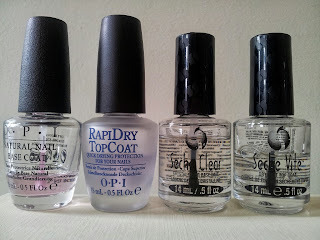 Since starting this blog I have been asked quite a few nail related questions. You'll find tips and advice regularly on the blog, but I thought it would be a good idea to put together a post outlining some of the basics for any nail art newbies. 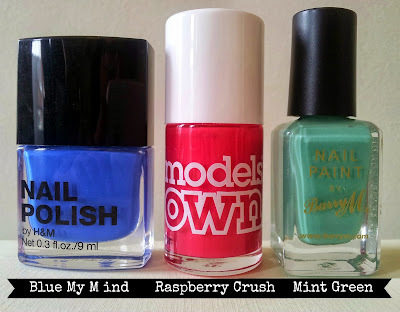 We use a wide range of brands, but our favourites are Barry M, Models Own and H&M. The reason for this is that they are good value for money, have great colour ranges, and regularly release new polish collections. It is important to always apply a base coat before painting your nails. The base coat helps the nail polish stick to the nail making it last longer. It also prevents damage or staining to your nails and makes them harder which stops bending or breaking. Make sure you run a cotton pad with nail varnish remover over your nails before applying base coat, this will ensure they are clean, dry and free from oil. Because I have pretty thin and brittle nails I splash out on Seche or OPI base coat to ensure a good hard base for my polish. I find myself regularly bleating on about the importance of a good top coat, and swear by Seche Vite. It's at the pricier end of the range, but it's so worth it. A good top coat seals the polish and penetrates through the layers to harden them. This means you don't have to leave them for hours before you feel safe to touch anything, or even go to bed (I know bed sheets printing onto nails is a common problem!). I also like OPI Rapid Dry as it really does what it says on the tin, but I only use it for plain colours as I find it can smudge nail art. There aren't many tools you need to create gorgeous nail art. We'd recommend the below as a basic toolkit. Nail art pens - These are available all over the place (even Primark does them now!) and are a godsend for creative nails. We use these in most of our designs as they make detailing much easier. We use both liquid pens and the ones that look like felt tips. 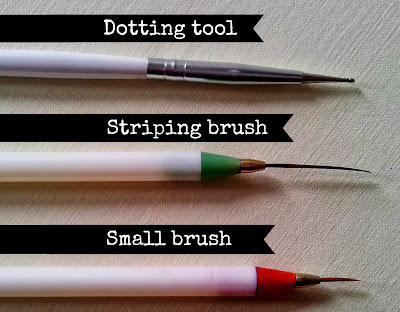 Dotting tool - This can be used to make dots in any colour. Just dip it in and dot it on! Striping brush - This is a long thin brush which is essential for straight, even lines. Dip it into any colour, ensuring an even amount of polish on the brush, then place onto nail and drag across. 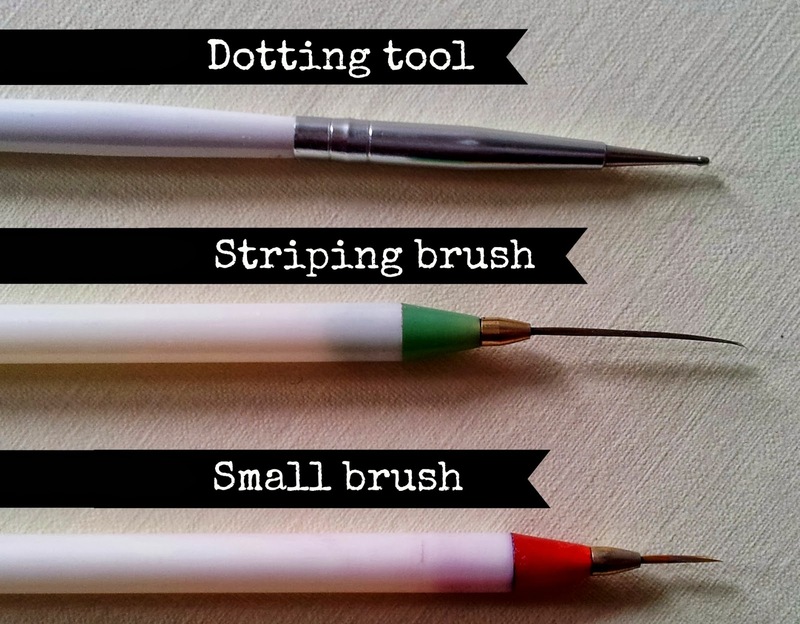 Small brush - A small brush is really useful for filling specific areas of colour and for detailing. I buy most of my nail varnishes at Superdrug and Boots. They often offer 3 for 2 deals which is when I stock up! All my brushes and tools come from Amazon where you can buy packs of 12 brushes for a few quid. I also use Amazon to buy some of the pricier polishes because you can often find good deals, although you may need to be patient with delivery. Hope this is helpful! If you have any more questions we're always happy to help. Really helpful post! I've been trying to get more into nail art recently, so now i know where to get nail brushes from haha!